READY FOR Anesthetic ACTION. Beds in the postoperative area of the soon-to-open Marshfield Medical Center-Eau Claire Hospital. Hospitals are often associated with long stays, hefty bills, and uncomfortable recoveries. Marshfield Medical Center-Eau Claire Hospital is looking to change all of that when it opens later this month. The new, advanced care, full-service medical center is a “micro tertiary hospital,” which means it provides specialty health care in a smaller space, Chief Administrative Officer Scott Polenz said. Among the hospital’s many new capabilities are cardiovascular surgery, a comprehensive women’s and infant care program, and inpatient and outpatient cancer care. The new hospital spans 213,000 square feet and has 44 beds in total, making the hospital smaller than others in the area. Because it is this compact, Marshfield Clinic needs to ensure efficiency throughout the hospital. Doing this will help the hospital reach its goal of delivering on positive outcomes and patient experience and, ultimately, lower costs. For the past 16 months, Marshfield Clinic has been building its new hospital along Craig Road and Clairemont Avenue, at the former site of The Plaza Hotel & Suites. Assuming everything continues on track, the hospital is aiming to open for business July 23, according to regional communications director Matt Schneider. Right away, they’re anticipating 80 to 90 percent occupancy. As is typical with hospitals, there are two generators and enough resources to keep the place running for about two weeks, Schneider said. These “redundancies on top of redundancies,” as Schneider referred to them, ensure everything will continue running smoothly in the event of losing power. Every aspect of the hospital – no matter how small it might have seemed – needed to be planned out, Schneider said. Everything in the building is constructed a specific way and located where it is for a reason. For instance, the patient rooms line the outside walls so they have large windows with views of the city to promote a relaxing recovery. During the construction process, more than 20 people gathered in one room to decide what the best height would be for different parts of the rooms to give patients the best experience, Schneider said. “It’s about creating a space that is efficient and as functional as possible for everybody – the nursing staff and the patients,” he said. For those visiting patients in the hospital, there are two waiting rooms – one on the second floor and one on the first floor – and a meditation room for private time, if necessary. As a nondenominational hospital, this room can be used for anything visitors need to help them during hard times, such as praying, meditating, or peace and quiet. The first floor was designed from the outside in, Schneider said. 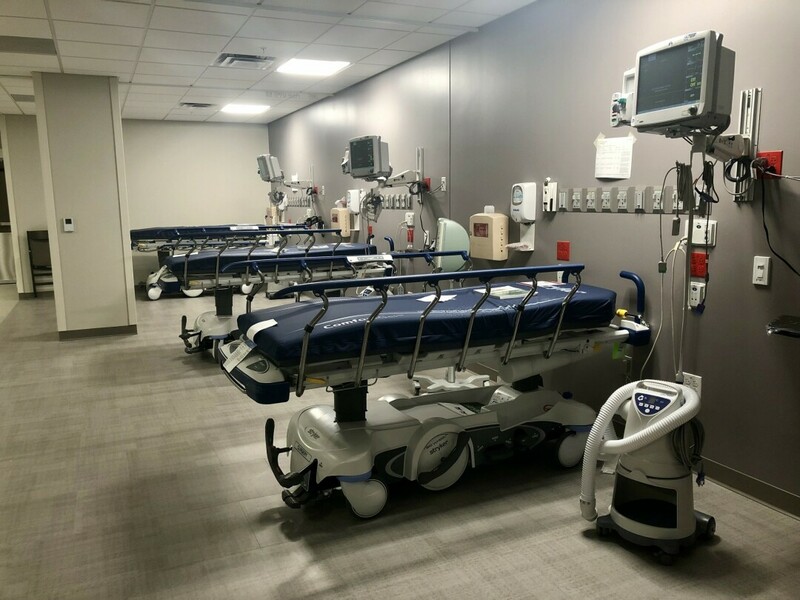 They laid out the first floor around the emergency room, which is set in the middle, with individual rooms to give patients privacy. The second floor is for surgery. The floor is complete with pre- and post-operative rooms, which have doors and curtains for privacy, if necessary, and TVs for those looking to pass time or distract themselves. The birthing center is located on the third floor, and it’s not quite like what people are used to seeing on television shows. For instance, there’s no room filled with cribs and babies, where new parents can look from the outside. Instead, there’s a small room with the same purpose, but most of the time, babies will be kept with their mothers in their rooms. The birthing center has eight beds in total plus a water birthing room, all of which are made to feel like hotel rooms and therefore be more comforting for mothers and mothers-to-be. The other part of the third floor is the special procedures area, where doctors can perform heart catheterizations and similar procedures. On the fourth floor is general nursing care and the critical care unit. Here, there are 36 beds. Instead of separating the space into different sections or departments, the staff will group together patients with similar conditions so it’s easier for doctors and nurses to float when they need to. Unlike the first floor, this level was designed from the outside in, because they wanted the patients to have views from the windows in the top floor of the hospital. Marshfield Clinic got the keys for the hospital from the contractors June 1 and have been finishing up the design process since. Before opening, the new hospital must pass an inspection to ensure everything is in perfect shape for patients. This is scheduled to be completed this month, with the hospital opening soon afterwards. Marshfield Medical Center-Eau Claire Hospital is located at 2310 Craig Road next to the Cancer Care Center and the clinic. Learn more online at marshfieldclinic.org.